Do you have any meals you ate as a child you thought everyone knew about, but then you grew up and realized it was unique to your family? That’s what this Amish Chicken and Noodle recipe is for me. These noodles were present at every church potluck and family reunion I can recall. They were made famous by my Aunt Betty. 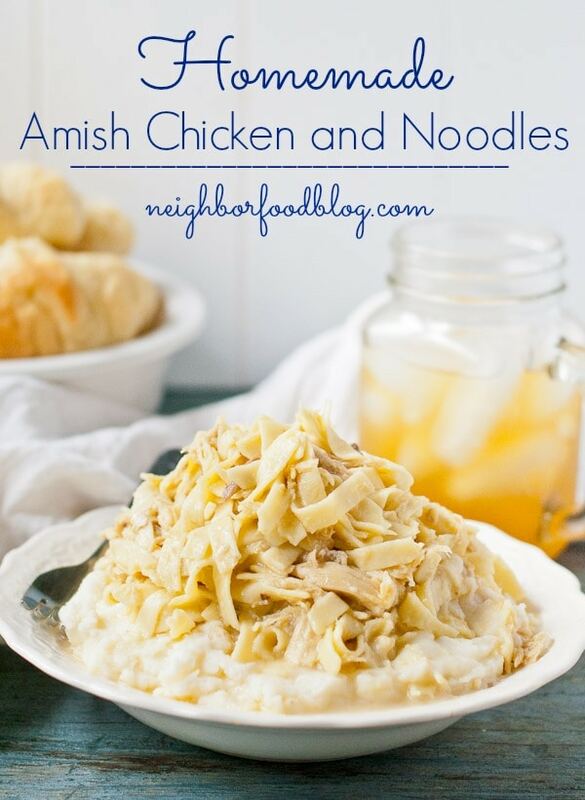 We always called them Aunt Betty’s chicken noodles, but I later realized they were also a mainstay at the Amish restaurant in my hometown, where they were simply called Homemade Noodles. It wasn’t until I traveled to Cleveland and shared a traditional Amish meal with my fellow food bloggers that I realized just how special these noodles are. Many of the bloggers had never had noodles like these, and it was so fun to watch others enjoy them for the first time. When I came home, I knew I had to finally get the recipe and learn how to make Betty’s famous noodles myself. This recipe holds so much nostalgia for me, and I don’t know if I can think of any other food that is more comforting. It’s only four simple ingredients, but they pack a big flavor punch. The recipe starts with a whole chicken placed in a slow cooker and covered with water. 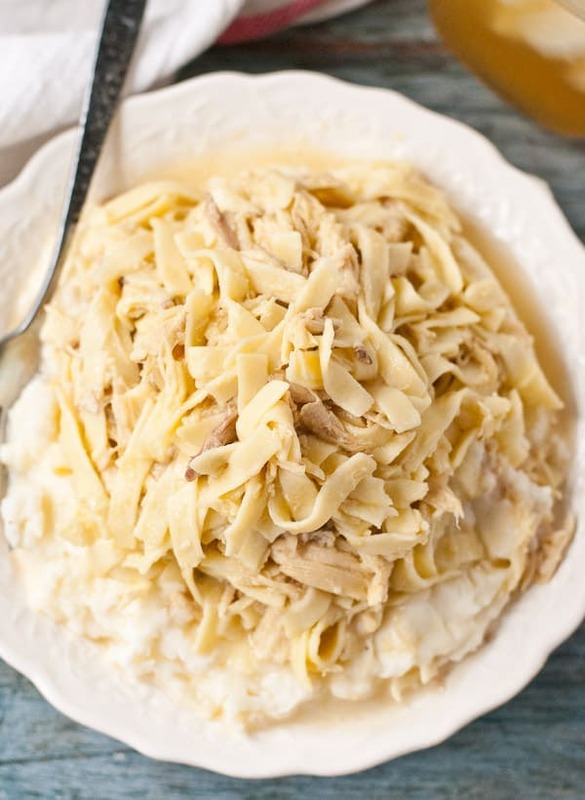 My favorite photo is the one of the raw chicken in the crock pot (said no one…ever)! The chicken gets cooked low and slow all day while you’re at work or busy taking care of business. After 8 hours, you take the chicken from the slow cooker and debone it. Don’t even think about throwing away all the broth left in the slow cooker. That’s where all the flavor is. The broth gets strained (carefully) into a large pot, along with all of the shredded chicken. Once the mixture is boiling away, in go the noodles and 5 Tablespoons of low sodium chicken base–I like to use Better Than Bouillon (affiliate). When you look for noodles, look for long and fairly thin egg noodles. Egg yolks should be one of the main ingredients on the package. You can also make your own homemade egg noodles from scratch for an extra special meal. I drain out most of the excess broth, but leave about a cup in the pot. The noodles will keep slurping up all the delicious broth and get better and better. I also add a few Tablespoons of butter because it’s the holidays and because BUTTER. I don’t even know if I can express to you how good these noodles are. They are completely infused with the flavor of the chicken. Savory, silky, and oh so comforting, you’ll want an extra large bowl. 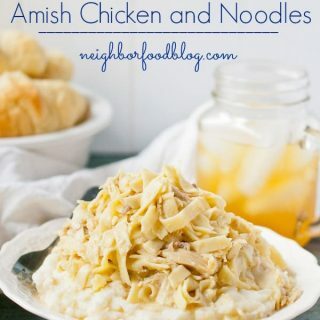 In my family, and in Amish circles, these noodles are always served over a mound of Creamy Mashed Potatoes. I know, I know, it’s a carbo-load to end all carbo-loads, but really, you have to try it. Make the noodles for your Thanksgiving dinner and just ladle a scoop or two over your mashed potatoes. I promise you won’t regret it, and you won’t even miss the gravy! 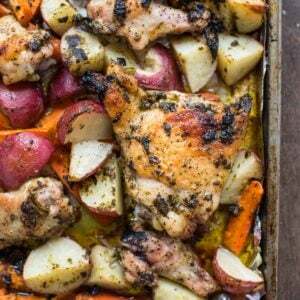 This recipe begins with quality chicken, and for that I used a Harvestland whole chicken. Harvestland has a range of all-natural chicken, turkey, and pork, and I love using their products in my family recipes. Their campaign, Eat Like Your Ancestors, is all about celebrating the recipes from our past and honoring family traditions. I couldn’t think of a more fitting way to do that than to share this recipe with all of you. I hope you’ll give these a try, and maybe even start a family tradition of your own. If you’d like to learn more about Harvestland, you can check out their website and find more traditional recipes on their Eat Like Your Ancestors page! UPDATE 3/25/18- So many of you wrote to tell me how wonderful this dish is with homemade egg noodles that I finally had to try it myself. It’s fairly easy to make your own noodles for this recipe, and I’ve created a tutorial for the process to make it easier. Click here to get the recipe and tutorial for homemade egg noodles! 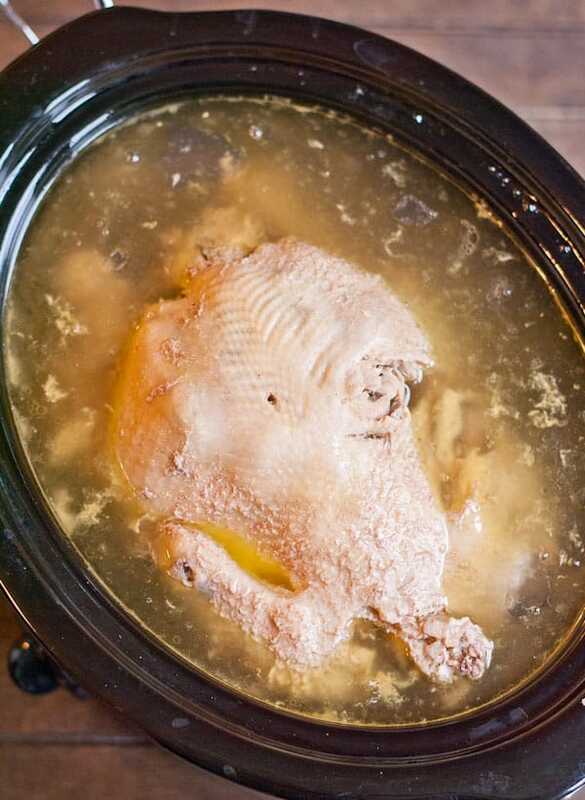 Place the chicken in a slow cooker and cover it with water. Set the crock pot to high and cook for 5 hours on high or 8-10 on low. Remove the chicken from the slow cooker and allow to cool slightly, then debone and shred the chicken. Carefully pour the broth from the slow cooker through a strainer into a large pot. You need enough liquid in the pot to boil all of the noodles, so if needed, add a cup or two of water. Add the chicken to the pot, then bring the mixture to a boil over high heat. Stir in four tablespoons of the chicken base, dissolve completely, then taste. If the broth doesn't have a strong enough flavor, add an extra Tablespoon or two to taste. Add the noodles and boil for 8-10 minutes or until noodles are soft. Stir in the butter, if desired, and allow it to melt. The noodles will be soupy, but they'll keep slurping up the broth the longer they sit. Plus, the broth makes a great "gravy" for your mashed potatoes. Feel free to strain extra broth off before serving if you wish. Serve noodles over mashed potatoes or as a side dish. This post is sponsored by Harvestland and I received their product to try. Um, whoa! In the dictionary these photos should be plastered right next to the entry for comfort food. Looks absolutely amazing. And perfect for this snowy day! Wait, SNOW??? We got a short little flurry, but nothing too dramatic. I’M SO NOT READY FOR THIS! Noodles over mashed potatoes? Hmm, not sure that’s enough starches. Why not just dish it all over a mound of rice on top of waffles and a loaf of Wonderbread? It’s a very popular combination, so cool it with the snide remarks. Having Italian, Polish, German and Austrian Relatives I have many awesome recipes for double starches. Goulash is served over Mashed Potatoes / Beef Stew over Rice / Pieroges are Pasta stuffed with mashed potatoes, cheese and bacon / etc. etc. All are Yummy on a cold day especially when you work hard out doors like on a farm and need all the energy you can get ! I like to butter a couple slices of bread and eat the noodles, chicken and mashed potatoes as a sandwich. The bread soaks up the broth beautifully! Okay, now that’s all I want to eat. Oh my gosh yes!! Perfect way to eat Homemade Chicken & Noodles. I`ve even taken buttered bread and add slices of American cheese, then mashed potatoes, the the chicken and noodles..
Oh my. That sounds like the most killer knife and fork sandwich of all time! I have my chicken in the crock pot right now!!! I’m so excited I can’t hardly stand it. I’m fighting the crud right now too, so I found this recipe just in time. Being an Ohio native living in Arizona during the holidays is tough, but this will bring me and my family right back home for some good ole Ohio comfort. Thanks!!! I’m so glad you get to enjoy these Ohio favorites even from several thousand miles away. I hope it turned out wonderful for you! I have made this dish for years and is a favorite. My kids — ages 40, 45, and 50 still request it when I go to visit. My only comment is where are the homemade noodles?? Please make your own noodles — do not use any purchased for any reason whatsoever!! And yes the only way is to eat over mashed potatoes! Oooo! This would be wonderful over stuffing! I think the cornbread would be very delicious. Especially cornbreadd that is homemade from scratch. When I visit my brothers who I see about every 3-4 yrs. My Homemade noodles with chicken over mashed potatoes has become the normal request. So easy to make egg noodles. To me there is nothing more comforting than good food and family. I liked it, & have a couple of recommendations. First, I used 7-8 T of chicken base (same brand as yours). Second, I did a reduction for 10-15 minutes before adding the noodles, which intensified the flavor. I also added pepper & my go-to poultry seasoning from Chef Paul Prudhomme. Very little broth to discard. Thanks for the tips! I bet that reduction really amps up the flavor! You have to get just the right ratio of nnodles to broth so the noodles will soak up that broth but still not be dry. I cook my chicken on stove top with onion and celery, s&p, added bouillon for deep flavor. Simmer about 1 to 1-1/2 hrs. till very tender, take chicken out and cool, debone, Have your made noodles ready, strain the both and discard the veggies, taste the broth and adjust flavor to your liking, bring broth to boil and add noodles slowly, stirirng to keep separated, boil till your noodles are to yor liking and broth is thick, then add cut up chicken, leave to cool down aand thicken. Another tip when making noodles you use extra flour to keep noodles separated, I just add any extra flour along with noodles to help thicken broth. /I agree homemade noodles are by far the best and a little more broth please. I use bone in thighs with the skin. Mmm…I’d love to try an all crock pot version! I’m not Amish, but come from southeastern Ohio. What makes this even better is to make your own homemade noodles. There is nothing tasty about store bought. I just came across this recipe and I grew up eating this. My parents are from Indiana. I make this from time to time but I live in Alabama and can’t find good Amish noodles. I had my grandmother’s noodle recipe but can’t find it now. Can anyone please give me a recipe for them? They really do need to be homemade. Thanks. I just talked to my mom (from Marion, OH) thus morning about chicken & noodles and she told me to mix together 4 eggs, 1/2 cup of water and as much flour as you need to make a good dough. Then roll them out, let them dry for awhile. When they’re almost dry cut them into long strips then cut the strips into noodles. Let them finish drying, then you can put them into the stock to boil. I think she said they take a half hour to 45 minutes to cook. That should say this morning. Sorry! I forgot to mention the kneading. My Better Homes recipe book says to mix 1 3/4 c flour with 1/2 tsp salt. Make a well in the center. In another bowl mix together 1 egg, 2 egg yolks, 1/3 c water, 1 tsp oil. Pour this into flour and mix to form a dough. Knead in 1/4 c more flour and til dough is smooth and elastic, about 8-10 minutes. Roll out thin. Cut into 1/4-inch wide strips, then cut into 2- to 3-inch lengths. That’s how my mom has always done it! I love this recipe. My grandmother in Illinois was a fantastic farm-woman cook. She made the best home-made noodles and we always served our chicken and noodles over mashed potatoes. We weren’t Amish, but I have a feeling after reading some of the other comments that it’s a midwestern tradition. We were surrounded by Amish, however, around my home town. Where in Illinois? I’m from Sullivan (right next to Arthur) and I am just now learning this is a midwestern meal. I make it raven better than my grandma’s! We layer a piece of white bread, mashed potatoes and chicken/turkey/beef and noodles! My favorite meal!!! Email the recipe to me So imay print it? These are not specific to the Amish. Any family that had worked on the farm had it as a mainstay. My Grandmother made these all the time, and then I found out out that my mother in law made them too. I just have trouble getting the flavor right when getting that creamy white texture. Maybe I need to pump up the bouillon, even though I prefer a little less salt. These are very common at Church suppers in Kansas. I nevet knew they were Amish. What I do know is that they are yummy. .comfort food at its vrry finest. I must make some soon. I grew up in Alaska and my mother was from NW Iowa and dish was a mainstay on cold days ….lol….about 80 % of the year ! And at -30 extra carbs are welcome! I moved to Wichita ks and they are also first item on menu sold out every Sunday in Yoder ks a large omish community! The south just doesn’t know what they are missing ! Great comfort food and recipe! Oh yeah! Those cold days definitely call for all the carbs! I’m glad to hear other communities know the joys of egg noodles and mashed potatoes! I make these a few times a year, but I don’t use bouillon base and I make egg noodles from scratch. 100% better than the best store bought noodles. Serving over mashed potatoes is a must. That’s why I only make it a couple of times a year. My Grandmother, a farmer’s wife born and raised in central Illinois, made these every Christmas and Thanksgiving. We filled our plates with turkey, mashed potatoes and stuffing, and then ladled her homemade noodles and chicken over all. It was heaven. Haha…I have a few other Amish recipes and they all have some vague ingredients like this. Thank you for sharing! I definitely want to give it a try with homemade noodles! 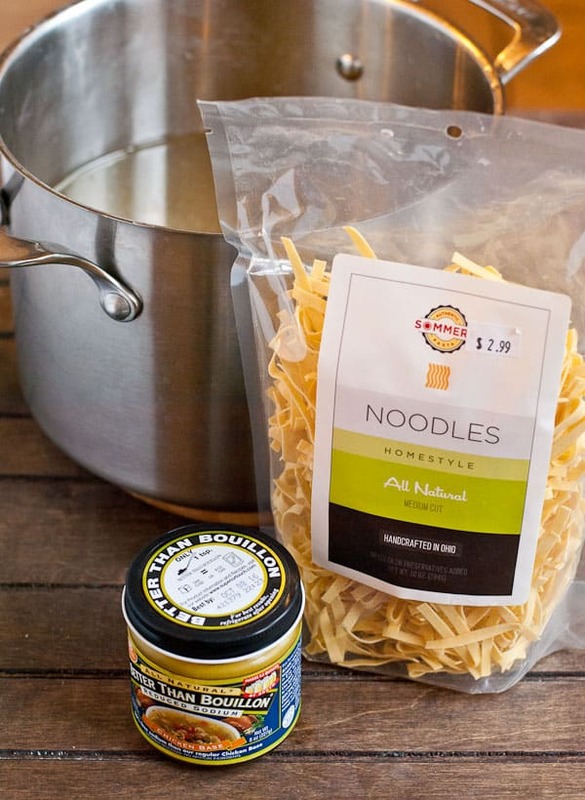 I cannot believe you use packaged noodles when it is so easy to make homemade noodles. Two eggs (or 4 egg yolks), two Tbsp. Milk, and two cups of flour. Mix together, let rest 20 minutes, then roll out as thin as you can. flour the dough, roll it up jelly-roll style, then cut the noodles as wide as you want. Unroll them and let them sit on the counter while you pick the meat off the chicken. You do not have to hang it around the house to dry Just 30 – 60 minutes is enough time. They beat the heck out of any store-bought noodles. I can whip up a batch in 15 min. Thanks for sharing your recipe for homemade noodles! I know for me and other busy moms sometimes that extra 20 minutes is really all that stands between me and takeout so prepackaged it is, at least for this season of life! I’m a big believer in doing whatever works for you and making dinner time as fun and stress free as possible. I ant wait until my little guy is old enough to help me make the noodles. I’m sure he’ll love it! What would you think about altering this recipe just a bit to turn it into a chicken noodle soup? Just leave more of the liquid? 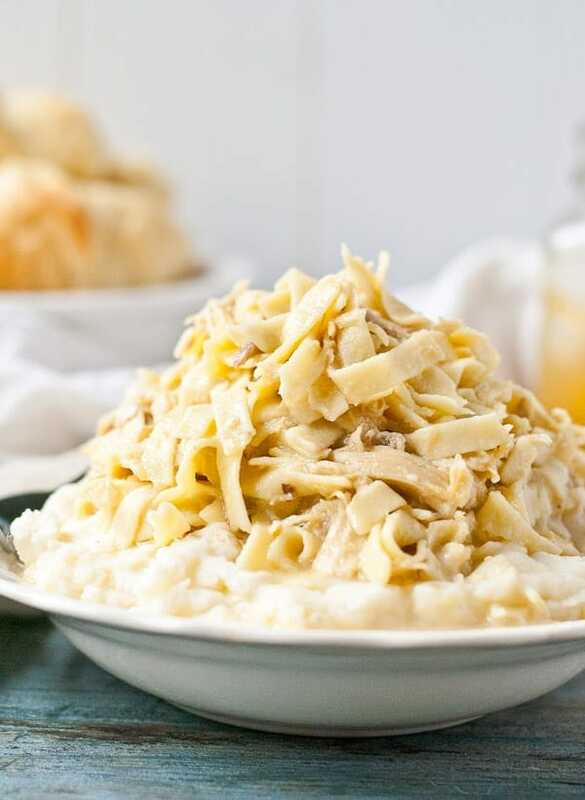 I have used this recipe a number of times to make chicken and noodles with potatoes, and the flavor is so perfect, I’m thinking about using it for some soup this time. Do you think that might work? I definitely think that would work! I would just leave more liquid and you could even add some carrots or celery to the crock pot so you have some veggies. If you have nothing nice to say,get off this sight and find one that fits your needs! These noodles are good but NOT as good as my Grandmothers homemade “dumplings” (called dumplings because of the shape they were cut). This chicken and dumplings was served by my Grandmother (German & Penn. Dutch) ever year around the holidays. I have learned how to make these dumplings and I much prefer them over the noodles. In my opinion these noodles are good but NOT as good as my Grandmothers dumplings. This makes a very delicious chicken noodle soup but there is no binder so forget the traditional Amish or not, chicken and noodles. You will waste your sweet time and valuable money!!! I was raised on beef and homemade noodles and YES, always over mashed potatoes. Oh so delicious…. This is the way I was raised to cook the chicken. Even my grandmother cooked whole chicken. But we always make are own noodles. By hand. I add little chicken broth to my broth. Noodles eggs,milnot,yellow food coloring,floor,salt. There so good love to just eat dough! I can’t believe you used packaged noodles. Homemade noodles are better and easy to make. I’m sure homemade noodles are wonderful, and not terribly difficult to make, but the extra 20 minutes makes a big difference when you have a hungry toddler waiting for dinner! I hope to try it with homemade someday, but for now we’re very happy with the Amish style noodles we get from our local market. Yum! Looks good. I make my own noodles. I think I might use more broth. Awesome basic recipe for chicken and noodles and best of all, no cream of chicken soup (it should be a crime to put that in chicken & noodles)! I grew up loving my Mom’s “recipe” and the only difference I found with these is that I did not make the homemade noodles. I agree that they are best, but I have a demanding job and teenagers and I just don’t always have time or energy for that. I still loved every minute of eating this and as always with this dish, the leftovers were even better. Serving with mashed potatoes is an absolute must! 🙂 I found that the amount of liquid was perfect once I let everything sit on the stove for a bit and soak it all up. I had struggled with that in the past, but I was also using just chicken breasts and boxed broth and not getting that natural flavor from the whole chicken. I have come to realize over the years that using the entire chicken + the broth is the only way to make chicken & noodles that are up to par for me. Thank you so much for this recipe! It is a keeper for sure! I am so glad you enjoyed it! Using the whole chicken definitely makes a big difference, and I also appreciate being able to make it with store-bought noodles on busy days! Made this for my family last week and it was a HIT! Thank you for sharing this. So glad you enjoyed it! Thanks for coming back to let me know. Just made these for my family and I have to say I’m a little disappointed. They’re ok…but kind of like glorified chicken noodle soup. Guess from all the comments i expected too much. Not sure what I did wrong. Followed the directions exactly. Sorry to hear you were disappointed. 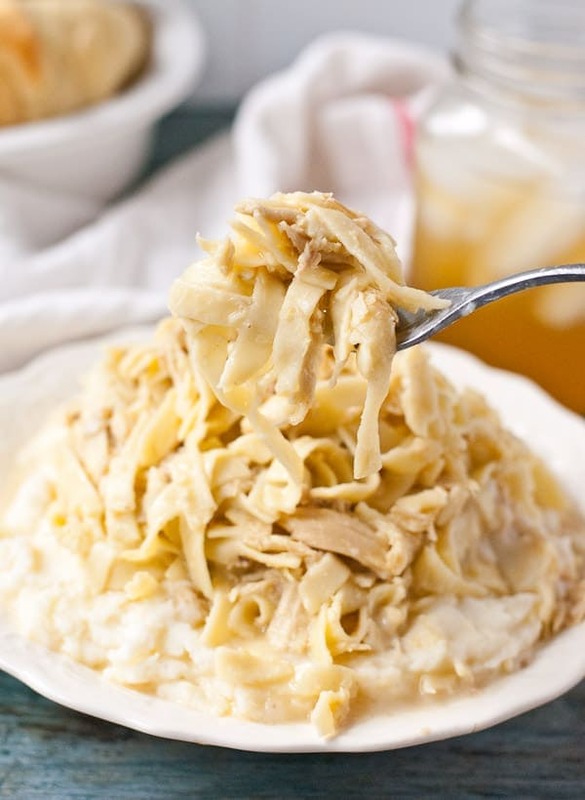 These kind of are like glorified chicken noodle soup…it’s a simple, comfort food recipe! My grandmother used to make something like this. Years later, we still talk about this dish. To those questioning putting the chicken and noodles over the mashed potatoes — just do it. It’s heavenly. My friend ask me to make this, he said it didn’t have any seasonings or a good stock, and he didn’t remember his Mother using carrots, celery, and onions to make a broth… I could not a recipe anywhere. Then he told me the ‘recipe’ had no ingredients it was just boiled un seasoned meat and pasta piled on more carbs I had to decline the request to ‘cook’ something like this ,then I found out out they were so poor growing up their parents had fooled them into believing that eating boiled unseasoned meat with pasta and potatoes was some kind of dish. it felt awful to imagine a child not having decent food to eat. Ok? What is the point of this of this comment? Every ethnicity has basic comfort foods… just because it doesn’t fit your taste buds doesn’t mean his family was poor. Also, celery and seasonings are cheap, not sure how those additions you suggested would elevate this meal to your master chef expectations? I just made chicken and noodles with mashed potatoes and have been wondering where this dish and beef and noodles originated. I haven’t found the answer yet. I’ve been eating this my whole life. We make our own noodles. Didn’t know you could buy them until I was married. Anyone know the history of these noodle dishes? Are these a Midwest meal? “Waffles…wonder bread…”. I’m sorry, but that was hilarious! Lawrence wins the internet today! ? For those of you making your homemade noodles, how long do you boil them in the broth? This recipe with store bought says only 8-10 mins. but I saw where someone said maybe 30 – 45 mins. Just what I was looking for! Men LOVE this chicken & noodles kind of meal. It’s what I like to make if I’m feeding a crowd. I’m so glad you liked it! It’s definitely a crowd pleaser! if you’re not making the noodles yourself then it’s not homemade chicken and noodles. How do you make those thicker noodles from scratch? Hi Rosemary! I’m working on a homemade egg noodle recipe that should be on the site soon! That way if folks want to make their own noodles, they can! This reminds me of growing up in Northeast Indiana with a number of Amish communities and the fantastic food. This is best when eaten at Das Dutchman Essenhaus in Middlebury Indiana. Ooh, you’ve given me something to remind me of “home” and I will be using your recipe! Awesome! I bet it is similar to the community in Ohio I grew up in. We have a Der Dutchman that serves something similar! What?!?! No recipe for the Amish Noodes!!! Our church just prepared tables upon tables of homemade noodles for our infamous homemade Chicken Noodle Soup for our County Fair. Extra egg yolks were added to each batch for the dough. Just curious. I just have one question, what would make your noodles disintegrate after you put them in the broth? Hmmm…did you boil them for a long time? I’ve never had this issue before. Grew up in Western PA – enjoyed these all the time as a child & made them for my own family all these years! The ONLY way to eat them is over mashed potatoes! You only have them a couple of times a year and you only live once! Salute! I came across this post after arguing with my husband about chicken and noodles! Thanks for helping me prove to him that people outside my hometown eat them (he’s from Utah and I’m from Kansas). Anytime anytime it’s sick or there’s a death or a birth this is what people bring. I just wanted to add that this recipe is also a great way to get rid of leftover Thanksgiving turkey. Turkey noodles are fantastic! Growing up in my Iowa home my mom made beef and noodles over mashed potatoes. So good and a wonderful comfort food. As per your March 2018 comment,Courtney,have you posted that homemade noodle recipe yet? If so, where might I find it? My mom makes chicken and noodles with her own homemade noodles–so yummy! But I think your version is easier than hers–using the crock pot is a great shortcut! 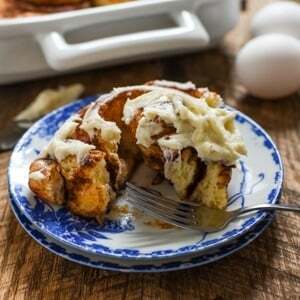 I have a couple of Amish cookbooks that I LOVE (and that I have my favorite chicken and noodles recipe in) but in a recent kitchen remodel, I’ve misplaced them–possibly still in a box?–so I’m happy to find this recipe. Thanks!